US Dollar and Euro are two most common currency types of present world. Do you want to convert Dollar into Euro or Euro into Dollar? Besides online currency converters like Curculator and Yahoo Currency, you can try Free Currency Converter desktop tool. It automatically fetches current currency conversion rate from the internet and allows accurate conversion. If internet is not available, then it remembers the last known exchange rate. 1. Download Currency Converter free tool. 2. Install the program & launch it. 3. Enter the currency amount. 4. Then select Currency type among: Euro and Dollar. 5. 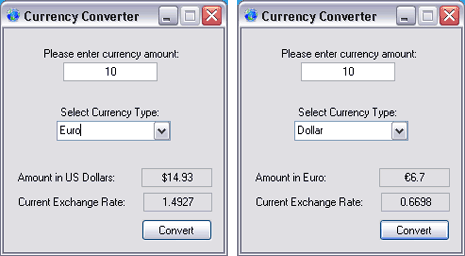 Click Convert button to see converted amount and exchange rate used for the conversion. Pretty handy, what say?